The goal of this challenge is to write a program or function that returns the least amount of strikes needed to complete a given course. The layout of the course can be passed in any suitable way and format you prefer. (read from the console, passed as an input parameter, read from a file or any other, multiline-string, string array, two-dimensional character/byte array). The start position of the ball and the hole can be passed as input too, it doesn't have to be parsed from the input. In the test-cases they are included in the course to make sure there is no confusion about the actual position. You can remap the input characters to something else, as long as they are still recognisable as distinct characters (e.g. printable ASCII characters). If the course is impossible to beat, return -1 (or any other falsy value of your choice that wouldn't be returned for a beatable course). In this example positions are notated 0-based, X/Y, left-to-right, top-down - but you can use any format you like since the result is completely format-independent anyways. The ball can't move diagonally, only left, right, up and down. The ball will not stop in front of water, only in front of walls, on sand and in the hole. The course is always rectangular. The course is always bordered by water or walls (no boundary checks required). There is always exactly one ball and one hole. Not all courses are possible to beat. There might be multiple paths that result in the same (lowest) score. This is code-golf, so the solution with the least amount of characters wins. Solutions must be able to handle all provided test-cases, if this is impossible due to restrictions of the used language please specify that in your answer. Returns 0 if there's no solution. Not the answer you're looking for? 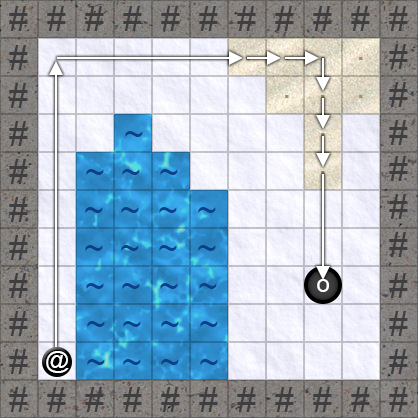 Browse other questions tagged code-golf game grid path-finding maze or ask your own question.